FREE Cone Day is back! 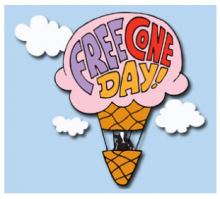 Stop by any participating Ben & Jerry’s Scoop Shop on Tuesday, April 12th for FREE Cone Day 2011! Chocolate Fudge Brownie is calling me! Head over to Ben & Jerry’s to find a location near you. Offers Apr 11, 2011 in BenAndJerrys, free · Expired! Here is another great free ice cream opportunity. On May 4th, get a FREE Sample of the all new Ben & Jerry’s Bonnaroo Buzz. Seriously, I might actually have to try this one! Light coffee and malt ice cream with whiskey carmel swirls and english toffee pieces, YUM! Bonnaroo Buzz will be available in Scoop Shops across the US. Stop by any participating Scoop Shop on May 4th, 2010 from 5-7pm to enjoy an exclusive Flavor Release Party, featuring music by Bonnaroo artists, giveaways aplenty, and Free samples of Bonnaroo Buzz! For more details and a location near you visit Ben & Jerry’s. Offers Apr 30, 2010 in BenAndJerrys, free · Expired! Save the date on March 23rd from 12 noon to 8:00 pm across the US, Ben and Jerry’s will be celebrating the 32nd Annual Free Cone Day – to say thanks! If you don’t live near a Scoop Shop, isn’t it about time you planned that road trip you’ve been thinking about. Offers Mar 18, 2010 in BenAndJerrys, free · Expired! Ben & Jerry are so proud of their favorite Maple Blondie, Hannah Teter for bringing home the silver they want to celebrate in true Ben & Jerry’s fashion. For one day only on March 3rd, stop by your local participating Scoop Shop and say,“Way to go Hannah!” and you’ll get a scoop of Hannah Teter’s Maple Blondie for $1 – yup a buck, while supplies last! In case you forgot, it’s Maple Ice Cream with a Maple Caramel Swirl and Blonde Brownie Chunks. Yummm. Offers Mar 2, 2010 in BenAndJerrys · Expired!